Oklahoma Connection | Spahn met his wife Lorraine, a native of Hartshorne, Oklahoma, while he was stationed at Camp Gruber in Muskogee. 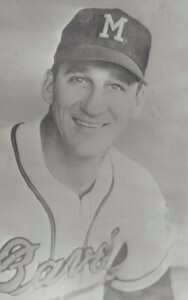 Warren Spahn’s record as a left-handed pitcher includes most games won in the majors (363); most consecutive years leading a complete game; most lifetime games won; and most strike-outs (2,583). He was elected to the National Baseball Hall of Fame in 1973.